In 2004, S. E. Hinton released Hawkes Harbor, her first novel in 15 years. Best known for gritty teen novels, like The Outsiders and Rumble Fish, Hinton spins an altogether different tale and an adult one. In the prologue, eight year-old Jamie is brought to an orphanage where the sisters look down on him as a product of sin who will not amount to much. In the next chapter, seventeen years later, Jamie is transferred to Terrace View Asylum having lost his mind. In his interviews with Dr. McDevitt, we slowly learn about the intervening years—never certain how much of it is true—about Jamie and his friend and mentor Kellen Quinn’s sea faring adventures. Eventually such misadventures, including a disastrous gun running scheme, land the two in the sleepy seaside town of Hawkes Harbor. Jamie begins working for the wealthy Hawkes family doing odd jobs. He learns of a hidden family fortune from the housekeeper. One night, he searches an old family crypt and unearths Grenville Hawkes, a vampire. I started having deja vu. This is Dark Shadows! The parallels became clear. Hawkes Harbor is Collinsport, and the Hawkes are the Collins family. Grenville is Barnbas Collins, Dr. Louisa Kahne is Dr. Julia Hoffman, and our central character, Jamie, is Willie Loomis. Kellan’s character matches up with Jason McGuire, but I’m not sure that Dr. McDevitt has a counterpart. However, other familiar Dark Shadows characters do make an appearance, though many are brief. This isn’t so much a retelling of Dark Shadows’ most well-known tale as it is a re-imagining. If it hadn’t been written by S. E. Hinton, I don’t know if I would have read this book. Nowhere does the book jacket state any connection whatsoever to Dark Shadows, which would have piqued my interest if it had been by another, less well-known author. At the time I read the book, not long after its publication date, I distinctly remember looking up online for more information. What I found then suggested that Hawkes Harbor was originally intended to be a Dark Shadows book, but when the rights fell through, Hinton changed locations, character names, and other details. Perhaps as a result of this, the novel is lacking needed depth. This is not Hinton’s best. Readers unfamiliar with the Dark Shadows storyline might very well get lost in the story’s shifting timelines. Those who do know the storyline may or may not like the direction this re-imaged novel takes. Overall, I enjoyed it. The story has its own merit—the Dark Shadows aspects were a plus—though I would have liked some characters and situations to have been explored further. 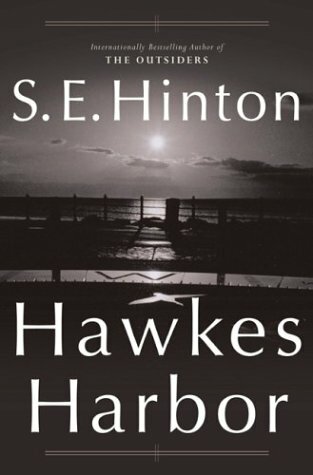 With a new feature film coming out this year (see here), those interested in Dark Shadows might well find an interest in S. E. Hinton’s take on it in Hawkes Harbor. Dark Shadows was a gothic soap opera that aired on ABC from 1966 – 1971, and has since become a cult classic available on video and DVD.